This super recently decorated property is available to rent mid May thus early viewing is encouraged as we expect demand to be high. The property is contemporary and offers spacious accomodation comprising; lounge, dining room, open plan modern fitted kitchen with casual living/dining area and separate utility room. On the first floor there are four well proportioned bedrooms, master with ensuite and modern family bathroom. Situated in Drumbeg the property offers easy access to main arterial routes, local golf clubs and parks. Viewing is a must to fully appreciate all this unique property has to offer, it is finished to a high specification and is ready for anyone to move in. On approach to Sandyhill before bridge heading out of Ballyskeagh Road from Upper Malone. 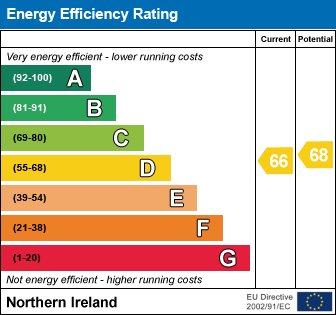 EPC: Current rating: 66. Potential rating: 68. Check out the property I found on PropertyPal.com: 24 Greenvale, Dunmurry, Belfast BT17 9LR.